Macalester College presents the 20th annual International Roundtable. This year’s theme is “Global Health: Promoting Equity Within and Across Borders.” The Roundtable runs Thursday Oct. 10 to Saturday, October 12, in the John B. Davis Lecture Hall, Ruth Stricker Dayton Campus Center. The Roundtable is free and open to the public. 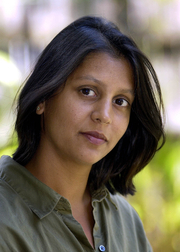 A full schedule of events is available at http://www.macalester.edu/igc/internationalroundtable/roundtable/2013/schedule/ Among this year’s speakers is Sonia Shah. Shah is an investigative journalist and author of critically acclaimed and prize-winning books on science, human rights, and international politics. Her latest book, The Fever: How Malaria Has Ruled Humankind for 500,000 Years, described by international malaria expert Malcolm Molyneux as "thrilling" and "astonishing," and by the New York Times as “tour-de-force history,” is based on five years of original reportage in Cameroon, Malawi, Panama and elsewhere. Shah has been featured on current affairs shows on outlets such as NPR as well as the BBC and Australia's Radio National. Her writing on science, global health, and politics have appeared in a range of publications such as The Wall Street Journal, The New York Times, and Le Monde Diplomatique to Scientific American and Foreign Affairs. Sonia Shah’s talk is entitled, “Private Interests, Public Health: the role of corporations in the global fight against disease.” Following her remarks, Shah will sign copies of her latest book The Fever, John B. Davis Foyer, Ruth Stricker Dayton Campus Center. Books courtesy of Common Good Books. An investigative journalist and acclaimed author of The Fever discusses malaria – a preventable disease that nonetheless kills nearly one million people every year. Sonia Shah is currently considered a "single author." If one or more works are by a distinct, homonymous authors, go ahead and split the author. Sonia Shah is composed of 3 names. You can examine and separate out names.